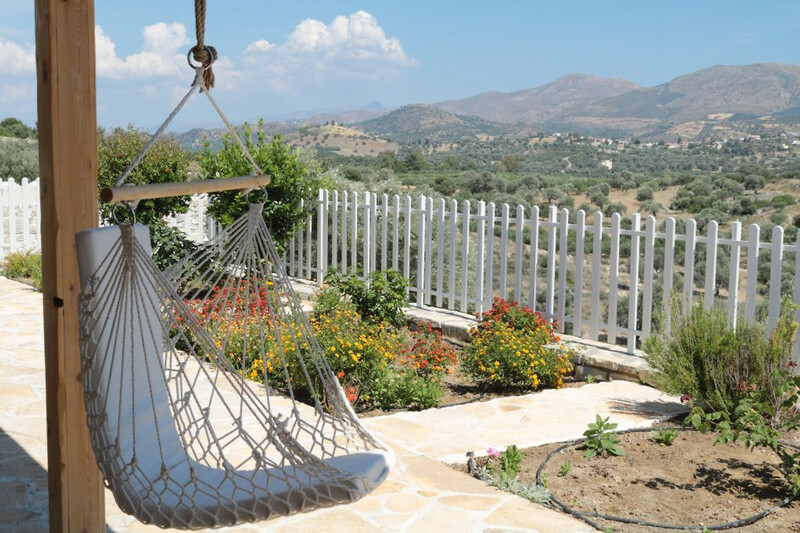 This absolutely private and peaceful family villa Aspruga is situated between flowering olive groves on the hillside, near the famous sandy beach of Komos (2,5 km), the traditional village Pitsidia (1 km) and the traditional village of Kamilari (1 km) away from all the everyday Noises From the house you can admire the tranquility, the beautiful unspoiled natural landscapes and the peace of the soul on the high demand of today's tourists. It is ideal for nature lovers and has a panoramic view on the landscape where you can enjoy sun, sea and mountains Like unforgettable sunsets! 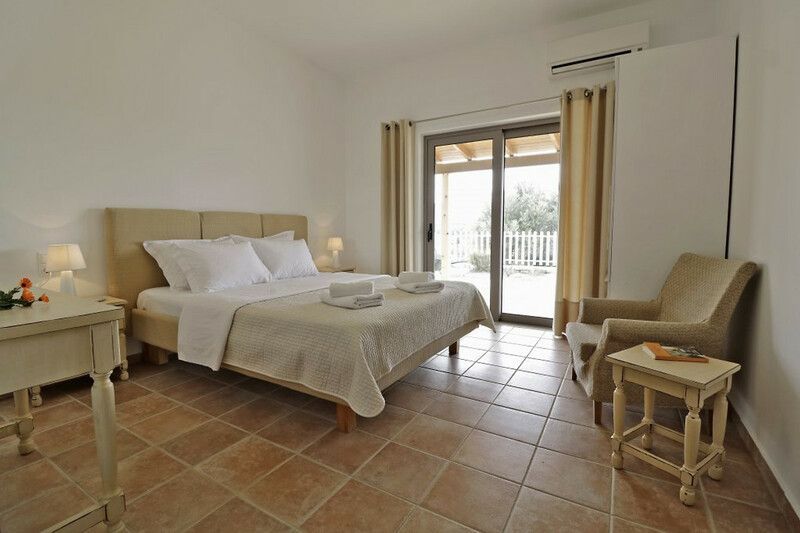 Villa Aspruga offers our guests complete peace and privacy, without immediate neighbors. Our secluded villa is a very comfortable house consisting of 4 bedrooms, 3 bathrooms, 1 large living room and 1 kitchen. 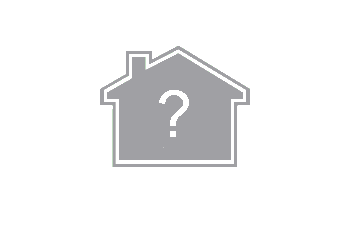 The 1 bedroom and 1 bathroom are located right next to the main house - extra block. It is located in a large garden with heated swimming pool, barbecue, outdoor barbecue and a comfortable seating area. 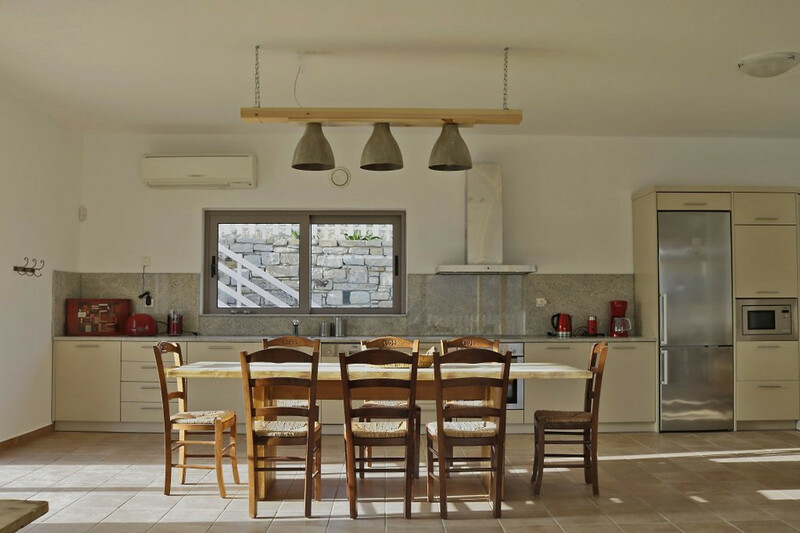 With this structure, our villa sleeps up to 9 people making it ideal for 4 couples, large families and groups of friends as it offers absolutely privacy and seclusion when desired! 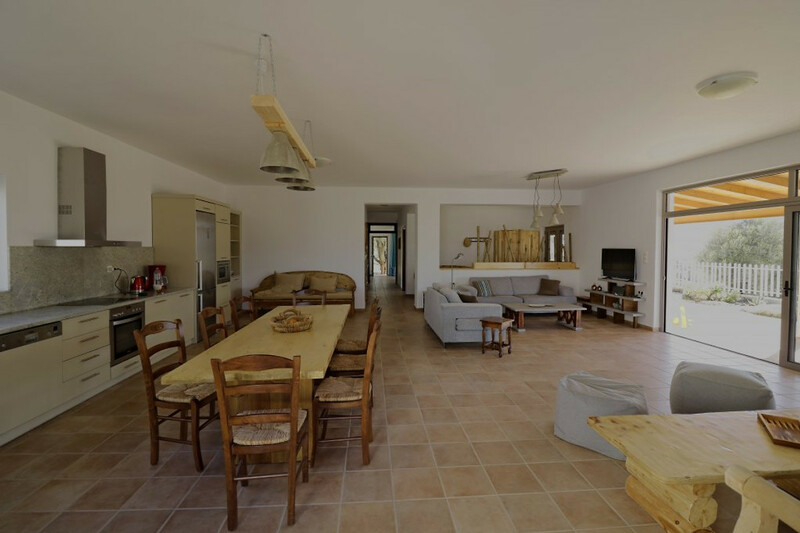 The villa is totally private and all the outside areas are at your disposal to make the most of your stay! Enjoy our private swimming pool (measures: deep and 4X7m) equipped with sun beds and umbrellas. The pool can also be heated (surcharge upon request the cost is 30euro per day). 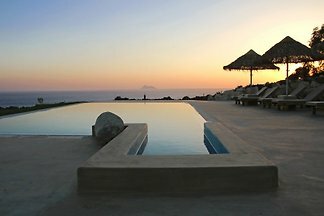 It also offers a beautiful view of the village of Pitsidia, mountains and small part of the sea. On cooler days, the swimming pool can be heated on request. In the pool area is a huge garden with aromatic herbs. All the garden and pool area are fenced and isttaly safe for the kids to play. You can relax your day by the pool and sunbathe and then have your dinner or lunch in the covered shaded area, with large dining table next to the barbecue area. Each point of the garden and the pool area offers a breathtaking view of the surroundings and the sunsets. The whole plot is about surrounded by olive trees and herbs. The main house is about 180m2 and consists of 3 bedrooms. 1 masterbedroom with 1 double bed, private large bathroom, 1 bedroom with 1 double bed and 1 bedroom with 2 single beds. 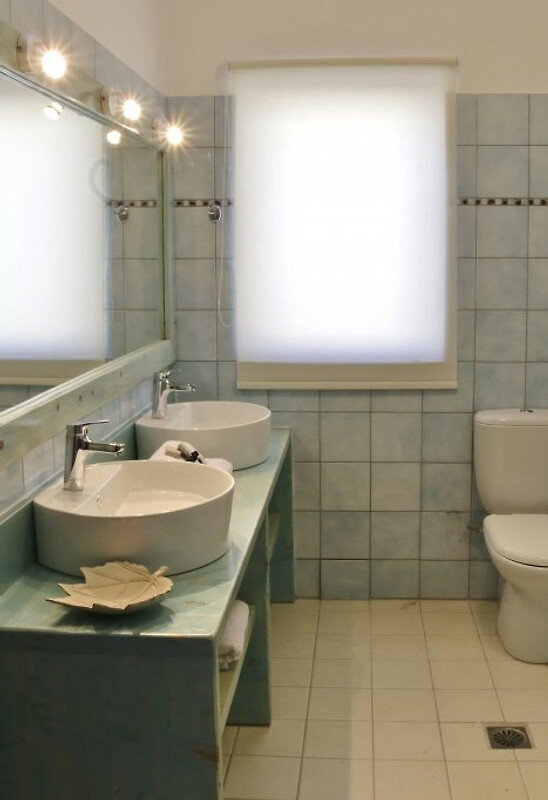 There is also another large common bathroom. 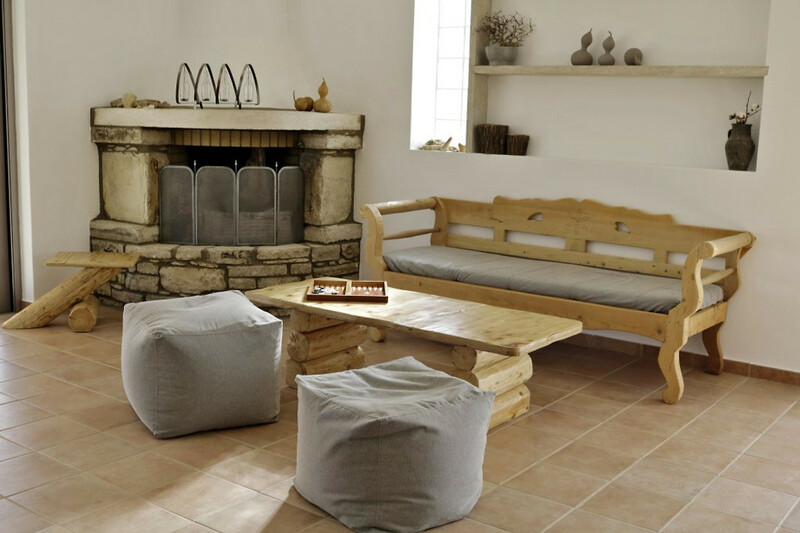 Villa Aspruga has a very large and comfortable living area with 2 sofas, fireplace and large windows with plenty of natural light and views of the surroundings. There is also a large fully equipped kitchen. 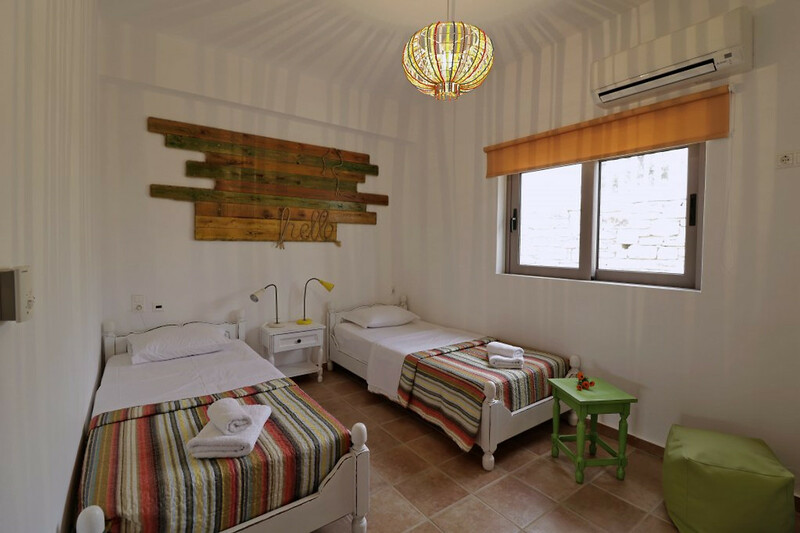 In every room there is A / C.
There is the separate space next to the main house-extra block (surcharge), which is about 50m2 with 1 large bedroom with 2 single beds which can be set as double, and we can add 1 extra single bed on request and 1 large bathroom. All you need, such as large shops, banks, hospital, post office, medical specialists, weekly market etc. are located only 13 km in the city of Mires. In a small distance, in the village Pitsidia (1,5km) you will find supermarket, family taverns, cafe, bakery and pharmacy. The nearest and most beautiful beach is Komos ( Km). 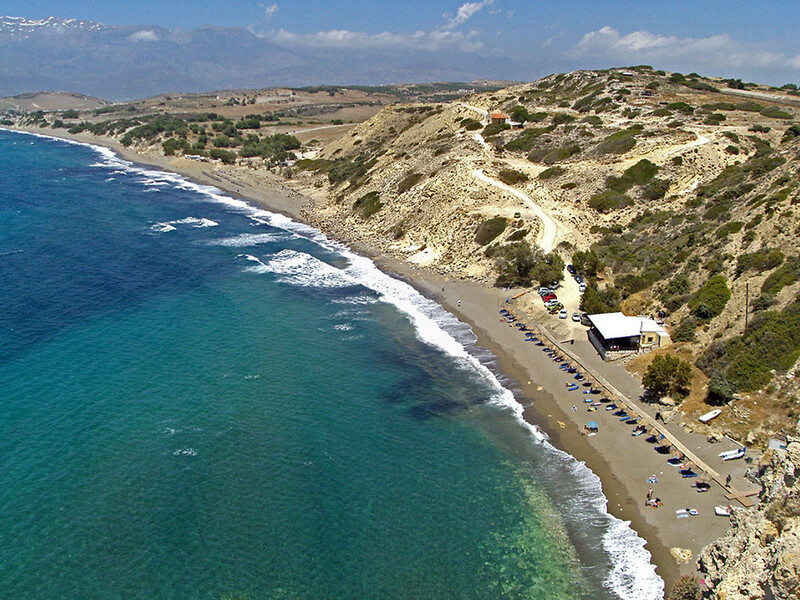 But there are many other beaches nearby, such as Matala, Red Beach, Kalamaki etc. You can also visit some famous archaeological sites such as Phaistos, Gortina, Agia Triada, Matala, etc. 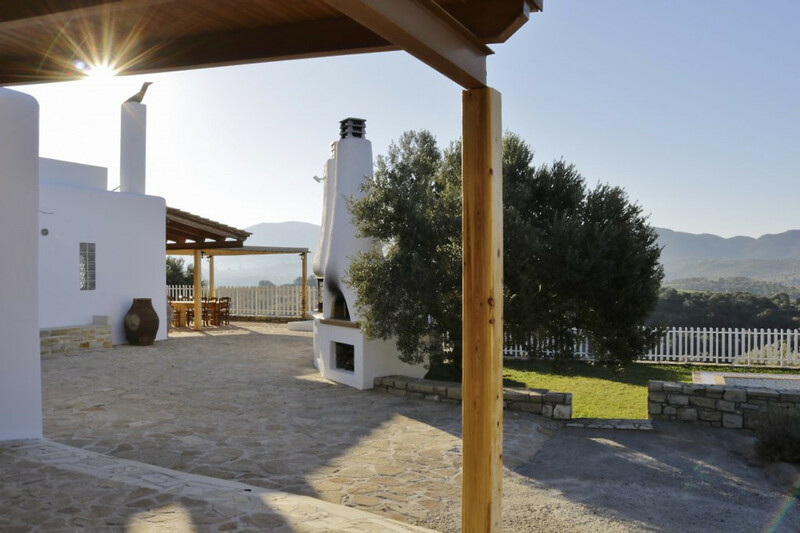 You can also visit tavernas in nearby villages such as Pitsidia Kamilari, Matala, Sivas and Kalamaki, where you can taste traditional Cretan recipes served with local products. You can also try hiking or cycling or sightseeing. You should definitely try wine and Tsipoudia (Raki). If you like the nightlife, you can visit the famous tourist village Matala (4 km), where you can find many shops, bars, restaurants, live music and Greek dance venues. The weather in southern Crete is more sunny than anywhere else in Europe with high water temperatures due to its proximity to North Africa and Libya. So set aside your everyday problems, recharge your batteries and enjoy your holiday! Everything you need, such as large stores, banks, hospital, post office, medical specialist care, weekly market etc. are located just 13 km in the town of Mires. In a small distance, in the village Pitsidia () you can find supermarket, family taverns, cafe, bakery and pharmacy. The nearest and most beautiful beach is Komos ( Km). 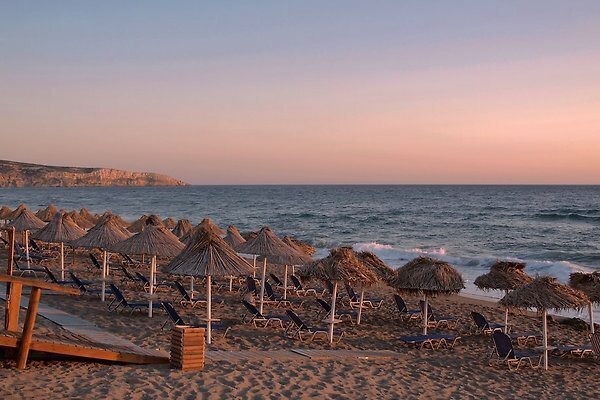 But there are many other beaches nearby, such as Matala,Red Beach, Kalamaki etc You can visit also some famous archeological sites such as Phaistos, Gortina, Agia Triada, Matala, etc. 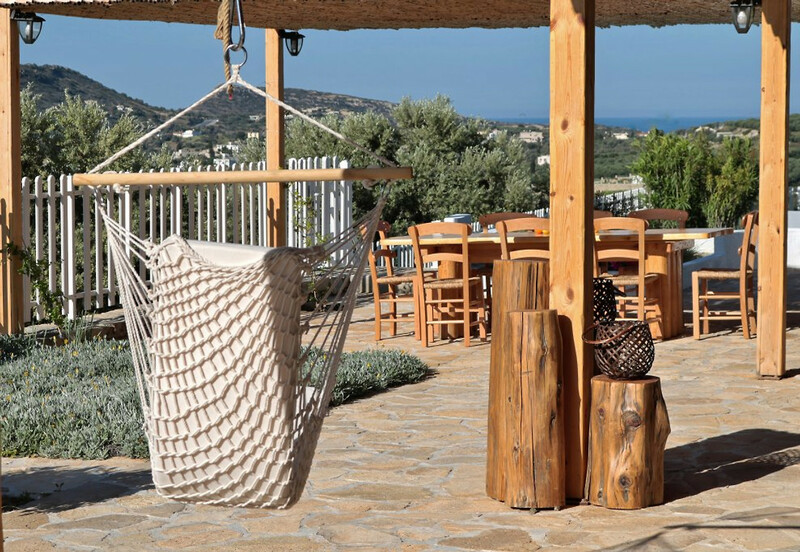 You can also visit taverns in nearby villages such as Pitsidia Kamilari, Matala, Sivas and Kalamaki where you can try traditional Cretan recipes which are served with local products. You can also try for hiking or biking or sightseeing as well. You should definitely try wine and Tsipoudia (Raki). If you like nightlife you can visit Matala famous touristic village (4km) where you can find plenty of shops, bars, restaurants, live music and Greek dancing places. The prices can be arranged according to the persons. You can also ask for our special offers the use of the heated pool is an additional 30euro charged for days. The weather in the south of Crete is sunnier than anywhere else in Europe with high water temperatures due to its proximity to North Africa and the Libyan. So set your everyday problems aside, re-charge your batteries and enjoy your holiday! Als wir hier ankamen, fühlten wir uns direkt zu Hause.Theodora und Manolis, unsere super lieben Vermieter brachten uns persönlich von Pitsidia Stadt zur Villa Aspruga. Hier angekommen waren wir erstmal alle überwältigt von der Aussicht und der wunderschönen Terasse. Die Begeisterung ging im Haus direkt weiter. Hier war der Kühlschrank mit Wasser gefüllt und ein Obstkorb für uns hergerichtet. Das Wohnzimmer mit den gigantischen, bodentiefen Fenstern gibt einem das Gefühl mitten in der kretischen Natur zu sein. Hier fehlt es einem an nichts. In der Küche ist alles vorhanden was man sich vorstellen kann! Die Zimmer top! Der Pool top! Das sogenannte Poolhaus hat ein Schlafzimmer, eine Küchenzeile und ein Bad. Auch hier sind bodentiefe Fenster zur eigenen Terrasse. Und auch hier ist der Blick atemberaubend. Hier aufzuwachen ist der Hammer! @Theodora: Du musst unbedingt Fotos einstellen! Eine Woche lang konnten wir - 2 Erwachsene und 1 Kind - diese ganz im Grünen, zwischen Olivenbäumen gelegenen Villa mit Pool genießen. Das Haus hat liebevoll und individuell eingerichtete Zimmer. Das Wohnzimmer ist großzügig und wir hatten eine wunderbare Aussicht. Jeden Tag genossen wir es, im Halbschatten unter der Pergola unser Mittagessen einzunehmen. Das Haus ist in Sichtweite des Dorfes an einem kleinen Hügel ganz zwischen den Olivenbäumen gelegen. Ruhe und Natur und doch ein wenig Luxus. Rund ums Haus gab es zu jeder Tageszeit für jeden von uns immer einen wundervollen Platz, um im Halbschatten zu lesen und zu entspannen. Und der Pool ist fantastisch. Unsere kleine Tochter hat ihn ihn vollen Zügen genossen und wir mit ihr. Wir haben sogar unsere eigene Pizza im Holzofen gebacken! Was unseren herrlichen Urlaub noch super toll umrahmte, war die zuvorkommende und herzliche Betreuung der Vermieter Theodora und Manolis. Vielen Dank an Sie. Wir freuen uns schon auf das nächste Mal .... ! Dear Evelyn, thank you so much for your nice words. It was great meeting you and your little daughter, and having you as our guests in our villa!We are always very delighted seeing our guests having fun and enjoying our place and our services. Looking forward to meeting you again. Wish you all the best! 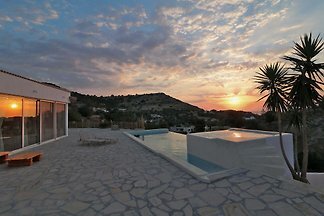 Vor einigen Tagen wurden wir in der Villa Aspruga in Pitsidia gehostet. Wir verbrachten 10 Tage mit unseren Kindern & wir waren begeistert von unseren Ferien. Das Wetter war ein bisschen frisch, wegen der Termine, aber das hat uns nicht daran gehindert, unsere Zeit zum Pool zu genießen, da es beheizt wurde. Der Ort war sehr ruhig & in absoluter Privatsphäre. Das Haus war komfortabel, sauber & komplett ausgestattet. Die Gegend ist wunderschön mit vielen kulturellen Orten & viel Grün. Pitsidia war sehr nah und es war ein typisch traditionelles kretisches Dorf. Vielen Dank an die Besitzer Theodora & Manolis, die uns alle notwendigen Informationen gegeben und uns geholfen haben, die Gegend zu erkunden. Wir würden auf jeden Fall empfehlen, diesen Ort und wir hoffen, in der Zukunft wieder zu kommen! Dear Sarah, Thank you so much for your kind comments and it was a pleasure to have you our guests . We are very happy that you enjoyed your stay and that you liked the villa and the place . We hope you visit us again. Als wir hier ankamen, fühlten wir uns direkt zu Hause.Theodora und Manolis, unsere super lieben Vermieter brachten uns persönlich von Pitsidia Stadt zur Villa Aspruga. Hier angekommen waren wir erstmal alle überwältigt von der Aussicht und der wunderschönen Terasse. Die Begeisterung ging im Haus direkt weiter. Hier war der Kühlschrank mit Wasser gefüllt und ein Obstkorb für uns hergerichtet. Das Wohnzimmer mit den gigantischen, bodentiefen Fenstern gibt einem das Gefühl mitten in der kretischen Natur zu sein. Hier fehlt es einem an nichts. In der Küche ist alles vorhanden was man sich vorstellen kann! Die Zimmer top! Der Pool top! Das sogenannte Poolhaus hat ein Schlafzimmer, eine Küchenzeile und ein Bad. Auch hier sind bodentiefe Fenster zur eigenen Terrasse. Und auch hier ist der Blick atemberaubend. Hier aufzuwachen ist der Hammer! @Theodora: Du musst unbedingt Fotos einstellen! Eine Woche lang konnten wir - 2 Erwachsene und 1 Kind - diese ganz im Grünen, zwischen Olivenbäumen gelegenen Villa mit Pool genießen. Das Haus hat liebevoll und individuell eingerichtete Zimmer. Das Wohnzimmer ist großzügig und wir hatten eine wunderbare Aussicht. Jeden Tag genossen wir es, im Halbschatten unter der Pergola unser Mittagessen einzunehmen. Das Haus ist in Sichtweite des Dorfes an einem kleinen Hügel ganz zwischen den Olivenbäumen gelegen. Ruhe und Natur und doch ein wenig Luxus. Rund ums Haus gab es zu jeder Tageszeit für jeden von uns immer einen wundervollen Platz, um im Halbschatten zu lesen und zu entspannen. Und der Pool ist fantastisch. Unsere kleine Tochter hat ihn ihn vollen Zügen genossen und wir mit ihr. Wir haben sogar unsere eigene Pizza im Holzofen gebacken! Was unseren herrlichen Urlaub noch super toll umrahmte, war die zuvorkommende und herzliche Betreuung der Vermieter Theodora und Manolis. Vielen Dank an Sie. Wir freuen uns schon auf das nächste Mal .... ! Vor einigen Tagen wurden wir in der Villa Aspruga in Pitsidia gehostet. Wir verbrachten 10 Tage mit unseren Kindern & wir waren begeistert von unseren Ferien. Das Wetter war ein bisschen frisch, wegen der Termine, aber das hat uns nicht daran gehindert, unsere Zeit zum Pool zu genießen, da es beheizt wurde. Der Ort war sehr ruhig & in absoluter Privatsphäre. Das Haus war komfortabel, sauber & komplett ausgestattet. Die Gegend ist wunderschön mit vielen kulturellen Orten & viel Grün. Pitsidia war sehr nah und es war ein typisch traditionelles kretisches Dorf. Vielen Dank an die Besitzer Theodora & Manolis, die uns alle notwendigen Informationen gegeben und uns geholfen haben, die Gegend zu erkunden. Wir würden auf jeden Fall empfehlen, diesen Ort und wir hoffen, in der Zukunft wieder zu kommen!